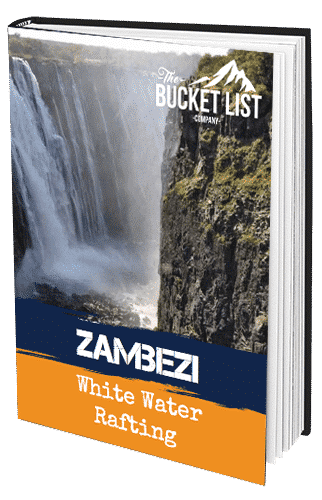 Simply Enter your details to download our free guide to rafting the Zambezi! Welcome to the start of your journey White Water Rafting along the Zambezi, the fourth longest river in Africa. You will get taken you through some of the world’s biggest commercially run rapids, from the best white-water on the planet, amazing sandy beaches, to a helicopter flight through the Batoka Gorge and over Victoria Falls – It is a proper adventure that starts right here! The Zambezi is the fourth largest river in Africa. The 3,540 Kilometre long river (2,200 miles) has its souce in Zambia. It flows through eastern Angola along the eastern border of Namibia. It then travels past the northern border of Botswana and between Zambia and Zimbabwe to Mozambique. This is where it crosses the country to empty into the Indian Ocean. The Zambezi’s best-known feature is Victoria Falls. Arrive at Livingstone and meet local guides. Transfer to the lodge and have a briefing about the Zambezi challenge. Optional river safari taking in great game sights and typical Africian wildlife. The Zambezi Challenge begins! Transfer to Victoria Falls and to our ‘put in’ point, another safety briefing and then we’re off! Before starting a rapid #1 we go for a swim in the rock pools right underneath Victoria Falls! Rapids today include ‘Morning Glory’ ‘Stairway to Heaven’ and more. More White water awaits! After a hearty breakfast, we encounter further rapids including ‘The Mother’ and one of the most Thrilling, Rapid #18 also called ‘Oblivion’. Overnight camp on yet another secluded beach. The Zambezi Challenge continues – the first rapid ‘Morning Shower’ provides us with just that! Another great day of rafting and overnight camp at yet another glourious beach, within sight of the magnificent Lower Moemba Falls. The Final day of our Zambezi Challenge see us take on ‘Ghostrider’ , one of the longest and biggest rapids on the Zambezi – a perfect end to our Challenge. Enjoy a helicopter flight back up the gorge giving us a birds eye view of what we’ve accomplished. The evening we enjoy a celebratory Dinner. Free Morning & Transfer to Livingstone Airport for flight back to UK. Arrive back in the UK or stay on for optional extra trips. To join our trek you will need to practice and train so that you have a substantial level of fitness and be able to trek for long periods of time in consecutive days. If you have any concerns then please feel free to contact a member of a staff to discuss whether this is the right expedition for you. Interested in finding out more about our White Water Rafting, Zambezi adventure?